Fresh Bread products. Bid opening is set for Monday, February 25, 2019, at 9:00 a.m. in the Central Services Building Room 304 located at 400 West Marion Street of Shelby North, Carolina (28150). Fresh Milk products. Bid opening is set for Tuesday March 26, 2019, at 10:00 a.m. in the Central Services Building Room 304 located at 400 West Marion Street of Shelby North, Carolina (28150). Forklift Repairs and Services. Bid opening is set for Friday February 22, 2019 at 1:00 p.m. in the Central Services Building Room 304 located at 400 West Marion Street of Shelby North, Carolina (28150). Registered Dietitian Consulting Services. Bid opening is set for Friday, February 22, 2019, at 9:00 a.m. in the Central Services Building Room 304 located at 400 West Marion Street of Shelby North, Carolina (28150). Equipment Repair Services. 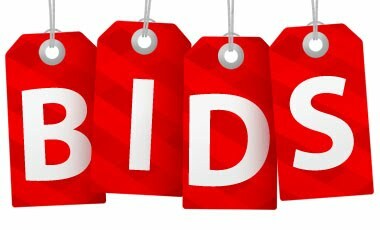 Bid opening is set for Monday February 18, 2019, at 9:00 a.m. in the Central Services Building Room 304 located at 400 West Marion Street of Shelby North, Carolina (28150). Frozen Ice Cream Products. Bid opening is set for Tuesday February 26, 2019, at 9:00 a.m. in the Central Services Building Room 304 located at 400 West Marion Street of Shelby North, Carolina (28150). Interested parties must contact Jada Brown, Child Nutrition Director at 704-476-8126 prior to the bid opening dates.